I'm already awake when my alarm goes off at 6am. After involuntarily rolling from side to side with the swell all night, my back hurts and I'm not exactly rested, but I'm wide awake. I crawl out of my bunk and quietly get dressed in the dark so as not to disturb my roommate. Ten minutes later, I walk into the dry lab and peer out the porthole window while my laptop flashes to life. It looks like another gray, overcast morning, but I can see a sliver of light on the horizon. I grab my camera, run up to the observation deck, and manage to snap a few photos just as the sun crests over the horizon. After a quick breakfast, I take my mug of coffee - careful not to spill it as I walk up the steep, narrow staircase - to the bridge. The captain greets me with a curt nod as I sit down for the morning meeting. Each “head of department” on the ship is here. The chief scientist, lead marine technician, ETO, chief officer, purser, and me— the "head" of outreach. The discussion about plans for the day occurs mainly between the captain and chief scientist, João Borges de Sousa. I love working with João. He routinely checks in to make sure I'm getting what I need, he encourages me to sleep more, and he teaches me how to say lovely things in Portuguese. He and the captain both demonstrate good leadership. Safety is paramount, but conducting as much science as possible remains a top priority. Today should be a good day for it. With minimal swell and winds gusting at about 15 knots, the team is cleared for both AUV and UAV operations. After the meeting, I refill my coffee mug and head back to the dry lab to start uploading a video for the shoreside team to review. Drone ops won't start for another 30 minutes, but it's a bright, sunny morning (finally) and I want to take advantage of the good weather. I wander up to the bow thinking vaguely of filming some b-roll footage. 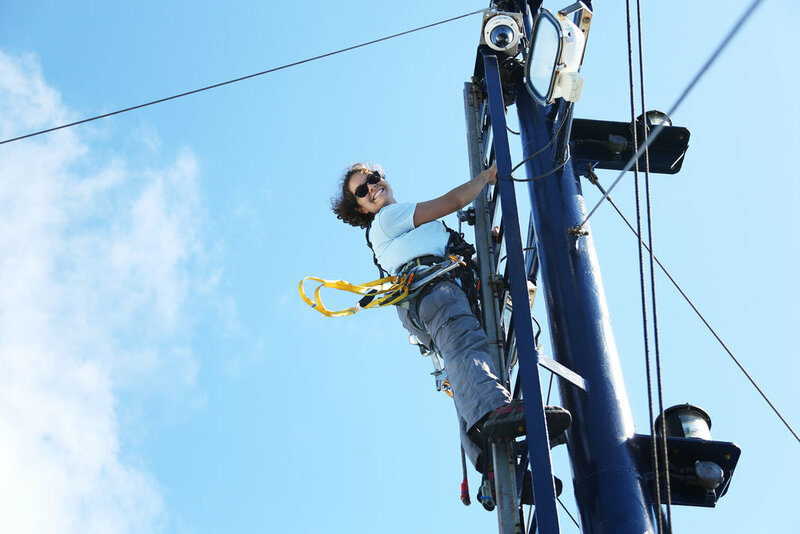 When I get there, I'm surprised to see Taly, one of our charismatic deck hands, at the top of the mast. She's wearing a harness loaded down with gear. On the deck below, several crew members keep a close eye on her movements. I walk over to Mick, our bosun. "What are y'all doing?" "Rescue training exercise," he says, keeping his eyes trained on Taly. I glance up again and see that there is a dummy hanging below her. She needs to rappel down to the "victim", clip it into her harness, and then climb back up. The ropes, harness and various pieces of gear obviously remind me of rock climbing and my friends at home. I snap a bunch of photos, tell Taly she's a badass, then head to the storage deck. Time to film things flying. Trent and Maria are already setting up their equipment when I arrive. I give them a quick smile, don my hard hat, and start filming. I knew I would become friends with Trent Lukaczyk as soon as I met him. With an unapologetic penchant for all things nerdy, an unwavering work ethic, and an arid sense of humor, he is easily one of my favorite people on the ship. We have many conversations about the value of doing things that are difficult. “Flying a drone off a ship is a very hard thing,” he said when I interviewed him. His co-pilot, Maria Costa, is also remarkably good at what she does. While Trent is responsible for take-off and landing, Maria is in control of the aircraft the rest of the time. They're a great team and I love documenting their quiet determination and absolute focus. I photograph Trent as he twists the propellers onto his FlightWave Edge, a VTOL (vertical take-off and landing) drone that he and his colleagues at FlightWave Aerospace have spent the past few years refining. I chuckle to myself. Even though I've heard him say those words dozens of times now, I still think this is so Top Gun. Anything worth doing is hard. Despite having a very hard job, Trent and Maria executed over 20 perfect flights during the expedition. The hours evaporate. Having skipped lunch, I run down to the crew mess to grab a handful of M&Ms and a granola bar. So much for that whole not eating sugar thing. I gulp down the chocolate and walk into the dry lab to check my email. Your connection has timed out. I try to refresh the page to no avail—the internet is down again. And my video didn’t upload. Of course. I shouldn’t complain. Being over 1,000 miles from land, it’s a small miracle that we have internet at all. But we’re currently between satellites and this is already the second time I've tried to transfer my video. There's nothing I can do about it now, so I smear sunscreen on my face, shove my camera into a dry bag, and head up to the upper deck. Hans and Leo are already in the work boat. I grab a life jacket and helmet and clamber in behind them. Hold steady. Documenting Hans and Lance as they get ready to deploy the LAUV from the work boat.